Jaimie Hicks Masterson is program coordinator Texas Target Communities (TTC) at Texas A&M University. TTC collaboratively works with communities to mitigate threats to the economy, environment, and culture. 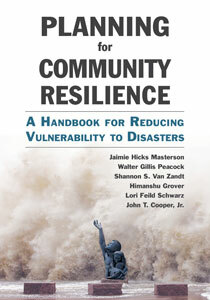 With TTC, Masterson develops community training curriculum on community resilience, vulnerability and asset mapping, city planning, and hazard reduction and mitigation. Masterson also helps communities access the tools necessary to make the most of local time, talent, and treasure, as well as, connects faculty and student expertise to community needs in order to provide high-impact service learning while supplementing gaps in low community capacity. Masterson received her Master of Urban Planning from Texas A&M University and earned a Certificate in Environmental Hazard Management. While there, she worked within the Hazard Reduction & Recovery Center to develop training curriculum on community resilience to disasters and educated practitioners across the country. Her thesis, Developing and Testing a Conceptual Framework for Flood Resilience, received first prize in the Engineering and Architecture Category for Student Research Week, the Melbern G. Glasscock Humanities Award, and second prize for the Vice President of Research Diversity Award. Masterson has professional experience in public education where she designed and carried out lesson plans for under-represented populations. She also has background and experience in landscape architecture, urban design, and environmental design and received her Bachelor of Landscape Architecture from Texas A&M University.